Photo credit: Christian Peacemaker Teams. Descriptions of Palestinian life and Israeli occupation in the West Bank city of Hebron. 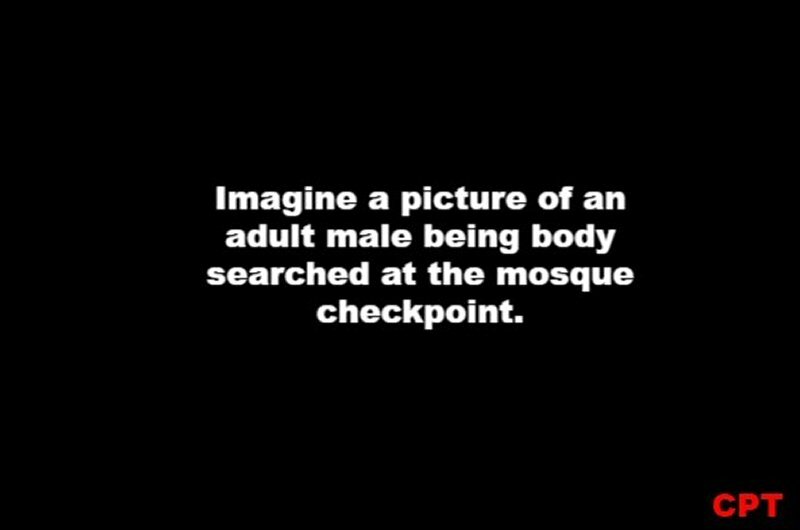 NOT pictured here: A young adult male on his way for the Ramadan Noon Prayer, is stopped by the Border Police at the Mosque checkpoint, and is first asked to show his ID. Next, in the full view of all those who are around the place, he goes through the embarrassment of being body searched. He has to lift up his shirt and both pant legs to prove that he is not carrying a weapon. After this, he is allowed to proceed to the mosque. Young adult males are often subjected to this ordeal when crossing the many checkpoints in Al-Khalil. NOT pictured here: Nearly every Saturday a group of settlers enter the old city surrounded by armed Israeli border police and soldiers. They fill the narrow tunnels and at certain places the soldiers prohibit Palestinians from moving past, disrupting their lives and restricting their access to their homes, the mosque, and other areas. On this Saturday, the soldier not pictured was on the alert, pointing his gun towards the roof while the settlers were stopped further down the street. NOT pictured here: A Palestinian family walks next the barriers dividing the road and past a Palestinian home that Israeli settlers are occupying. They continue to walk until they reach Abed’s checkpoint where they pass the border police, and turn around to walk down the other narrow side of the road to arrive at their neighbors home. The middle, wide section of the blocked road prevents them from simply walking the couple doors down past the occupied house to arrive at their destination. NOT pictured here: During the month of Ramadan, many devout Muslims go regularly to pray at the Mosque, particularly for the night prayer. As the Ibrahimi Mosque in Al-Khalil is the fourth holiest place in the world for Muslims, many also go there during the month of Ramadan. Close to the time of prayer, the tunnel leading to the mosque checkpoint is crowded with families, many with children and babies in arms. Often the Border Police are slow in opening the turnstile gates due to stopping people for bag and body searches, leading to a huge backlog of people waiting impatiently to be on time for the prayer, and getting restless with yet another show of power and control. Children often break this mood by doing something funny like crawling under the turnstile gate or pushing through with colored balloons. The future of week in photos? Pictured here: A bill is before the Israel parliament that would make the photographing, videoing, or recording of Israeli military forces a crime. The bill mentions the punishment will be based upon the intent of the person recording, but how does a court determine intent? In Palestine, where even a poem that expresses discontent with occupation and a desire for freedom can result in jail time for “incitement”, there is a very real danger of this law being used to target journalists and human rights monitors who would document the abuses of the Israeli forces. We encourage you to sign this petition to stop this bill from progressing.